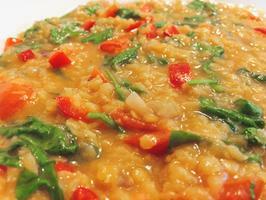 It’s so easy, quick and cheap to make fabulous tasting lentils. You only need a few basic ingredients. 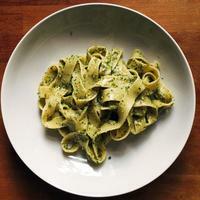 This should only take you about 20 minutes to make. 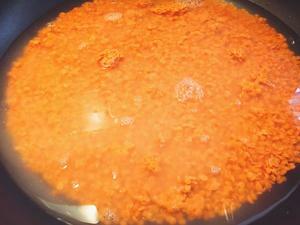 Rinse 1½ cups of lentils and add to a large sauce pan. Cover with water and cook on a low to medium heat. 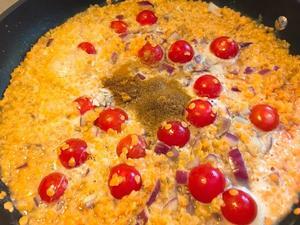 Add chopped onions and cherry tomatoes—stir and continue cooking. Add one heaped spoon of ground cumin, salt and cayenne pepper to taste. Stir everything and continue cooking. 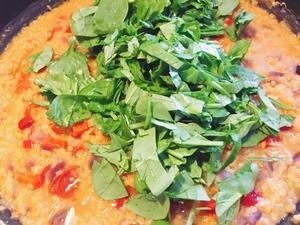 You may need to add water while cooking the lentils but don’t add too much. It’s better to add the water as needed rather than pouring a large amount in one go, unless you want the dhal to be more like a soup. 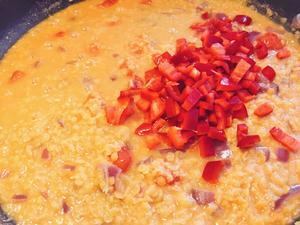 I prefer the dhal to have a creamy consistency. 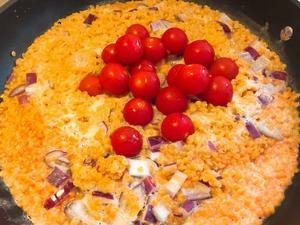 Once the dhal is nearly cooked (the lentils will begin to go soft and their colour changes from red to orange), add the diced red pepper and stir. Cook for another few minutes and add water if required. Switch off the cooker and cover the sauce pan with a lid. The cherry tomatoes should now be cooked too and will have lost their shape too. Check the taste and add salt/cayenne pepper if required. When you are nearly ready to serve the lentils add the chopped spinach and cook for a few minutes on a low heat until the spinach begins to wilt a little. Switch the cooker off. Add olive oil and stir well. 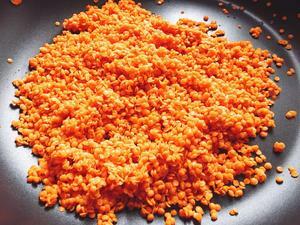 You don’t want to cook the dhal anymore. The oil is added for flavour but you also don’t want to loose the nutritional benefits of the oil by heating it too much. 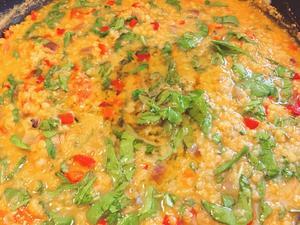 Your dhal is ready to serve—eat with nan bread, rice or on it’s own with a simple salad.